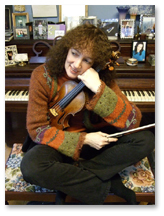 Amy Barlowe, violinist and composer, received her B.M. and M.M. degrees from the Juilliard School after studies with Ivan Galamian and Margaret Pardee. Her chamber music coaches include Josef Gingold, Felix Galimir, Samuel Rhodes and Earl Carlyss. She is the recipient of numerous awards including the Helena Rubinstein Scholarship, Atkinson and Northwest Area grants. Her critically acclaimed solo recitals and chamber music performances have taken her throughout the United States, Canada, and Mexico, as well as to the major concert halls of New York City. Josef Gingold praised her for "...fine musicianship, excellent instrumental qualities, and a devotion to all things musical." Ms. Barlowe has been featured on PM Magazine, performed as guest artist on numerous radio stations, and toured extensively throughout the Northwest as violinist of the Oregon Trio. Ms. Barlowe’s original compositions and arrangements include works for two violins and piano, an opera ballet, and a Requiem Mass. Her two Celtic duos for two violas, appear on a CD recorded by the Aureole Trio and have been released on the Koch International label. Recently, Ms. Barlowe’s arrangement of “Schindler’s List” for two violins piano received the endorsement of John Williams and has been published by Hal Leonard for two violins or violin and viola with orchestra, as well as for the same combinations with piano. Ms. Barlowe’s “12 Etude-Caprices in the Styles of the Great Composers”, newly published by Alfred Publishing, is receiving accolades worldwide. Formerly Associate Professor of Violin at Willamette University in Salem, Oregon, Ms. Barlowe has held teaching positions at the Juilliard Pre-College and New York's School for Strings, as well as the Estherwood and Bowdoin Summer Music Festivals. Currently, she is on the artist/faculty of the Meadowmount School of Music and the Ohio Conservatory. In 2006, she founded a vibrant new chamber orchestra called Akron Baroque. Ms. Barlowe’s biography has been listed in Who’s Who in America, Who’s Who in American Women, and Who’s Who in the World. To learn more about her visit Ms. Barlowe's website.